For a gardener there is no greater joy than harvesting the fruits of your labour. 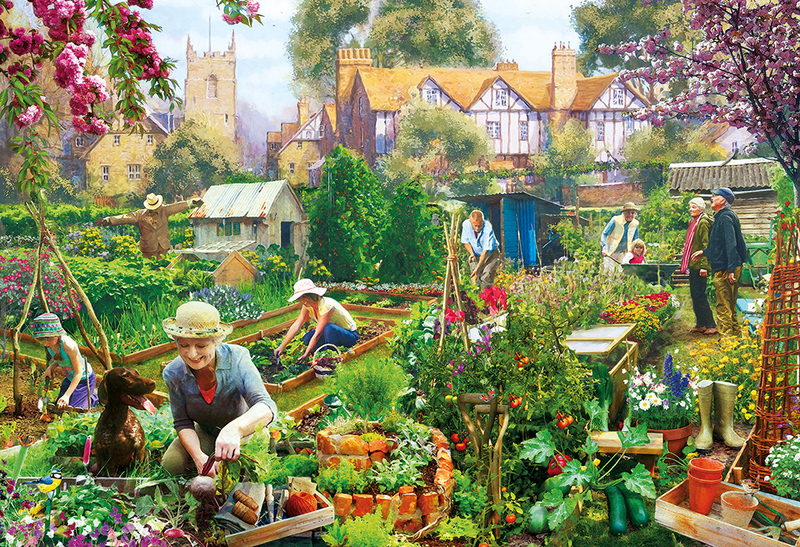 This allotment in Stratford is bursting with fragrant flowers and delicious vegetables. The whole family is pitching in with the work, even Milly the dog! Beautifully painted by artist Mat Edwards. Mat was scouted for his artistic talent whilst still at school winning an apprenticeship with Johnson Mattheys. Here Mat learnt many traditional skills but also credits them for teaching him most important thing of all, patience. His current work has evolved from using purely traditional materials to digital techniques or as he would say painting without the mess! Mat lives at home with his wife and three children and enjoys walking the dog, history, photography and spending time with his family and friends.